As a public service, What’s Next Blog periodically reports on the number of self-appointed social media gurus, ninjas, warriors and visionaries. There has been epic growth since our last report. The June 2014 What’s Next Blog social media guru Twitter Bio list (researched on FollowerWonk) has grown to epic proportions. The list now tops 297,897 – up from a mere 16,000 when we first started tracking them in 2009. By January, 2013, the count has swelled to 181,000, causing us to note that social media experts were multiplying like rabbits. In 2014, we note that the numbers have begun to multiply more like roaches. An additional 59 people have joined the rank of “Twitter whores”, which is a more than a little scary. 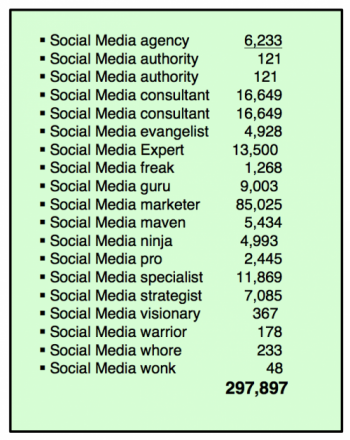 The ranks of social media consultants have nearly doubled. Twitter bios allow a mere 140 characters, plus a URL. Therefore, one must boil one’s bio down to what one thinks represents one’s most essential facts. While the self-appointed guru titles have dropped by half, one thing has not changed one bit: guru is still something someone else calls you. Clearly, we are moving toward to day when everyone on Twitter will be a social media expert. And a sad day that will be. i’m confused by your table. the table double-counts “social media consultant” and “social media authority”. excluding the double-counts, my calculator totals to 169379. how do you arrive at 297897? Not sure what to think of this. Besides the peculiar double listing of ‘consultants’ and ‘authorities’, your numbers aren’t even close to adding up.